Bishop Walsh High School course offerings include complete academic programs for the college-bound student as well as courses available at the Center for Careers and Technological Education. 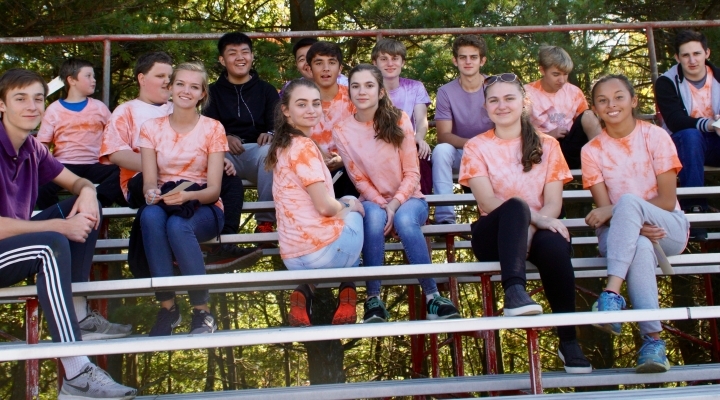 The Administration at Bishop Walsh has worked in conjunction with the Superintendent of Schools for Allegany County to arrange for qualified students of Bishop Walsh to select courses at C.C.T.E. during their Junior and Senior years. This can be achieved only if there are at least 10 students who are interested and who qualify. - The students have earned a minimum of 6 credits per year at Bishop Walsh. - The students have fulfilled the credit requirements for 9th and 10th grades in Religion, English, Social Studies, Science, Mathematics, Fine Arts, Physical Education/Health, Keyboarding, and Computer. Credits are assigned to each course. To receive the assigned credits, a student must receive a passing grade in that subject for which he or she has been enrolled. A student may not apply for early graduation from Bishop Walsh School. All students must take a minimum of 7 credit hours all 4 years at Bishop Walsh. A minimum of 24 credits is required for graduation. One credit is equal to 120 clock hours of instruction. The office of Campus Ministry has the responsibility of overseeing the religious activities of Bishop Walsh School. The program of School Ministry addresses three important areas of Christian Formation: Growing as a person of faith, experiencing Christian Community, and reaching out in service. Electives to complete a total of 24 credits, the minimum number required for graduation. Phase 1 - Courses are designed for students who need emphasis on the skills of the course. Phase 2 - Courses are designed for students who need moderate emphasis on the basic skills of the courses. These courses are college preparatory. Phase 3 - Courses are designed for students whose command of the basic skills enables them to pursue a more detailed study of the course material. These courses are Honors level. Phase 4 - These courses are Advanced Placement and taking of the national exam is mandatory. Courses at Bishop Walsh School, High School Level, are weighted according to difficulty and assigned quality point values for corresponding grades. The Honor Roll is determined by general average. The grade is meant to indicate whether or not the student is working to his or her ability level. - A student whose quarter grades are all 93% or higher earns PRINCIPAL’S HONORS. - A student whose quarter GPA is 3.5 and has no grade lower than 85% earns FIRST HONORS. - A student whose quarter GPA is 3.0 and has no grade lower than 80% earns SECOND HONORS.